So, what is asthma, and how can you best manage it so it doesn’t have an adverse affect on your life. Asthma is a very common, and potentially dangerous, condition that affects your airways. Its causes inflammation of the airways, as well as increasing the production of mucus (phlegm). Asthma is triggered by allergens that irritate your lungs. It is what causes the reaction that narrows your airways making it harder for the air to pass through. This is what makes it more difficult for an asthma sufferer to breathe. And what brings about your asthma symptoms. If you are concerned you may have asthma then visit your doctor. Asthma can be a serious condition, so getting it diagnosed as quickly as possible is very important. The first thing your doctor will do is look at your symptoms. Sometimes this enough to make a diagnosis. This test involves you blowing into a spirometer. It helps to see how well your lungs are working. The measurements are compared to the average measurements for your age. If you have a low reading it means that you have narrow airways. The cause of asthma. To make sure that the diagnosis is asthma, you may be given a reliever inhaler to use. You would use it, and then be tested again. If your measurements were higher it would show that the medication had worked and you are more than likely have asthma. This is used to measure how fast you can blow all the air out from your lungs. To do this a peak flow meter is used. If your peak flow reading is low, so slower, compared to the expected reading for your age, then your airways will likely be narrow. Again, as for the spirometry test, this is a good indication that you have asthma. You may be given a meter to take home for a couple of weeks. You can keep a diary of your readings, and any asthma symptoms you are experiencing. This will help to recognise when your symptoms are getting worse. And also help to figure out how well a treatment is working. There are other tests available if a diagnosis is still unsure. For most people that is unnecessary. Once your diagnosis is certain, you can start looking into what triggers your symptoms. Everyone has different triggers which could bring about their symptoms. These will irritate your lungs and start the allergic reaction that causes your airways to narrow. And your symptoms to appear. If you know what your triggers are you can avoid them as much as possible. Its hard to eliminate them totally. Whichever ones are problematic, you can make your environment as asthma friendly as possible. There is no definite answer to what causes asthma. Its not known why one person is a sufferer, while another is not. People of any age can develop asthma. It is common for it to start in childhood. Around 1 in 10 children have asthma. Though half of those children do grow out of it. It can develop in adults. Around 1 in 20 adults have asthma. If you grow out of it as a child there is still a chance that it may return. Although there is no cure for asthma, there are many ways to manage your condition. This is an important part of managing your asthma. It will help you to reduce the risk of an asthma attack. Preventing the symptoms from getting worse. Medications are used to control and manage your asthma. This is a written plan. You would normally complete it with your doctor and specialist. It is normally completed when you visit your doctor after you have been diagnosed. If you are ever admitted to hospital because of a severe attack you will also complete a plan. Or review your current one. Your plan will be reviewed at least once a year. Though if your asthma gets worse it will be looked at again, and changes made if needed. These are the most commonly used asthma treatment. They are used to get medication straight to the inflamed airways. It is a very effective way of treating the symptoms of asthma. Some people have trouble using inhalers. This can be combated by using a spacer. A spacer is a plastic container. It has a mouthpiece at one end. At the other end is a hole where your inhaler would fit. The drug is released from your inhaler into the plastic container. You then slowly breathe in the drug through the mouthpiece. 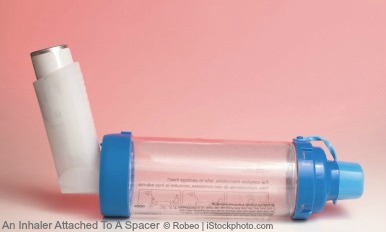 Your doctor will show you how to use your inhaler and spacer properly. With a spacer you can use any of the following inhalers. These are used as and when you need them. As the name suggests they will relieve your symptoms. They work quickly, by relaxing the muscles around the airways. This helps to widen them, so you can breathe easier. It is rare to have any side effects to this type of treatment. So they are ideal to use regularly. Though if you need to use it more than 3 times a week you may need to start using a preventer inhaler. However severe your asthma is you would always be given a reliever inhaler as part of your treatment. You will recognise it as it is usually blue in colour. This type of inhaler doesn’t work straight away. It works over time to reduce the inflammation of the airways. They help to prevent any symptoms occurring. A preventer inhaler needs to be used daily. It can take 7-14 days to be effective. So daily use is important for building up the protective effect of the drug. You will start on a dosage that controls your symptoms. When they have improved you will receive the lowest effective dose. You can still use your reliever inhaler if you need it. Though the drug in the preventer inhaler should reduce the amount of asthma attacks that you have. Preventer inhalers are usually brown, orange or red. This type of inhaler is used alongside a preventer inhaler. It should not be used on it's own. It has been reported that using just a long acting inhaler could increase your risk of an asthma attack. A long acting inhaler maybe given if your symptoms don’t improve after using the other types of inhalers. They work similar to a reliever inhaler. Though they are not quite as quick to work. But they are effective for up to 12 hours. These are usually given as a short term solution. Normally between 1-2 weeks. They can help with a severe asthma attack. They reduce the inflammation in the airways. Once your symptoms are manageable again you would go back to using just your regular treatment. There are worries about the side effects of oral steroids. If they are taken correctly and for a short time, any potential side effects are rare. It's trade name is Xolair. It would only usually be given if you have persistent, severe asthma. Normally if it cant be managed by other treatments. It helps reduce inflammation by affecting the immune system. The treatment would be injected into the body. It is given every few weeks in a specialist asthma centre. If it is not effective after 16 weeks treatment is stopped. By using preventative measures and taking the right medications most people would be able to manage and control their asthma so it doesn’t have too much of a negative impact on their life. Asthma can have a massive effect on someone's life, and on the people around them. If you have severe asthma it can affect your whole life. It can be life threatening. It is a serious condition. I have given you an overview of what is asthma. But always get, and follow, medical advice about any aspect of the condition. This will help you to help yourself, or your child, limit the effect it has on your life.